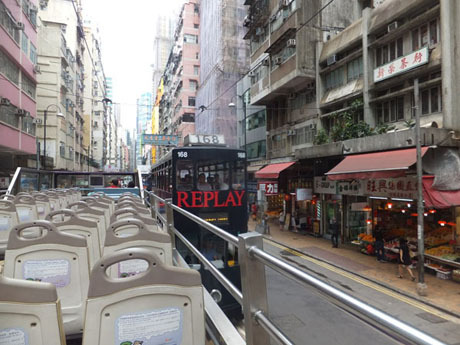 Until late 2008 the only way to see Hong Kong from an open-top bus was either to take the Citybus service 15C bus operating on the short journey from Central to the Lower Peak Tram Terminus to connect with the Peak Tram or join a group tour on a specially hired bus. However there are now three companies operating “turn up and go” open-top sightseeing tours. 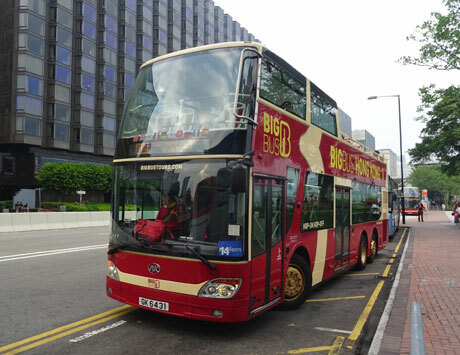 UK-based THE BIG BUS COMPANY introduced a “hop-on, hop-off” service on two routes serving Hong Kong Island and Kowloon in December 2008. A third route was added from April 2010. 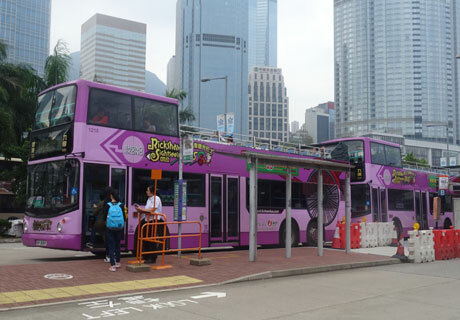 In May 2009, local operator CITYBUS commenced its CITYTOURS non-stop sightseeing tour of Wan Chai and Causeway Bay districts of Hong Kong Island and in October 2009 its sister company NWFB (New World First Bus) RICKSHAW SIGHTSEEING BUS introduced its “hop-on, hop-off” service along two routes on Hong Kong Island. In December 2014 the two routes were consolidated into a single route H1 "Heritage Tour" which revised the tour to a circular route including some districts of Kowloon and in June 2016 the route was adjusted from a circular basis to two-way route. During October 2009 New World First Bus introduced its "NWFB Rickshaw Sightseeing Bus". The "hop-on, hop-off" service utilises open-top double-deck buses decorated in a rickshaw-themed livery and mock rickshaw style canopy at the rear of the top deck. The rickshaw branding is intended as a reminder of the early 20th century when the Chinese rickshaw was an important form of public transportation around Hong Kong and gradually replaced by buses as the most popular public transport. 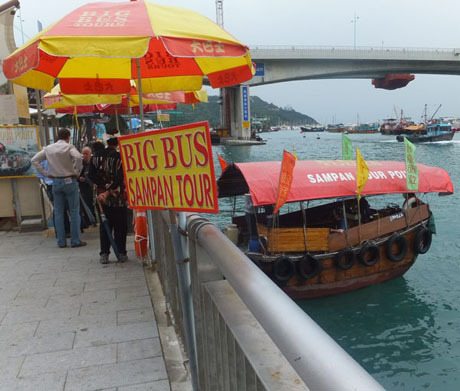 From 13th December 2014 a revised H1 "Heritage Tour" was introduced travelling a circular route from Central Star Ferry Pier at 30 minute intervals and takes about 105 minutes from start to finish under normal traffic conditions. The route served 28 stops and included numerous scenic locations including 20 declared monuments, 29 grade-one historic buildings and other landmarks including some major shopping malls and markets. From 18th June 2016 the service was revised from a circular route to two-way operation with a journey time of about 68 minutes each way. From 21st October 2017 NWFB rationalised its Rickshaw Sightseeing Bus operation introducing a new "Market Route H1A" with a single daily departure and renumbering its previous "Night Scene Route H1 as "Night Scene Route H2". The daytime "Heritage Route H1" continues to operate at 30 minute intervals except that the 10-30 departure from Central Piers is replaced by "Market Route H1A"
Operates from outside Man Kwong Street, outside Central Pier 6, Hong Kong Island daily at 10-00, 11-00 and then every 30 minutes until 16-30. Operates from Kowloon, outside The Peninsula, Hankow Road, Tsim Sha Tsui daily every 30 minutes from 11-15 until 19-15. Operates from outside Man Kwong Street, outside Central Pier 6, Hong Kong Island daily every 30 minutes from 17-30 to 20-30. Operates from Kowloon, outside The Peninsula, Hankow Road, Tsim Sha Tsui daily every 30 minutes from 19-45 to 21-15. Single Journey HK$33 per trip. One-day Pass (unlimited journeys within one operating day) HK$200. Half-fare concession for seniors age 65 and over and children age 3-11. Octopus Card or exact cash can be used to purchase passes or single journey tickets. Rickshaw Sightseeing Bus on Des Voeux Road West, known as "Dried Seafood Street"
Buses are equipped with a bus stop name announcement system and a video system with bilingual journey commentary in Mandarin and English. The Big Bus Company started operating "hop-on, hop-off" sightseeing open-top bus tours of Hong Kong in December 2008. 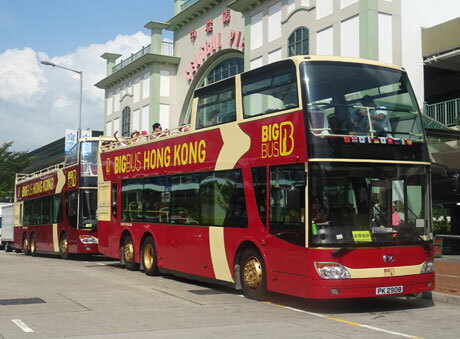 Big Bus Company was established in 1991 and at the time it launched in Hong Kong it also operated open-top bus tours in London, Dubai and Philadelphia. It merged with Paris-based sightseeing tour operator Les Cars Rouges in May 2011 to form Big Bus Tours and is now the world's largest operator of open top sightseeing tours, operating in 16 cities on three continents. The Hong Kong tour was initially limited to a single route around Kowloon but was soon extended to include a route on Hong Kong Island providing passengers with a unique way of visiting many of Hong Kong's most popular attractions. 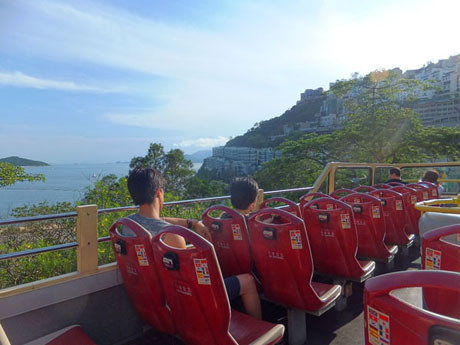 In April 2010 a third route was introduced taking in Stanley, Repulse Bay and Ocean Park on the south side of Hong Kong Island. The company has a fleet of about 25 buses in Hong Kong. The RED ROUTE on Hong Kong Island starts at Central Pier 7 (Star Ferry Pier) in Central and takes in Central, Admiralty, Wan Chai and Causeway Bay with stops at Hong Kong Convention and Exhibition Centre, Causeway Bay SOGO, Park Lane Hotel, Wan Chai Computer City, Lower Peak Tram Terminus, Mid-Levels Escalator, Man Mo Temple and Hotel LKF at Lan Kwai Fong. Service operates from 9-30am to 6pm daily every 30 minutes. Tour duration, about 1 hour, 30 minutes. 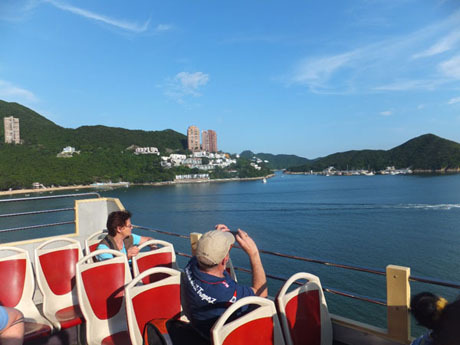 The GREEN ROUTE on Hong Kong Island starts at Central Pier 7 (Star Ferry Pier) and includes Ocean Park, Repulse Bay, Stanley Market and Aberdeen with stops at Ocean Park, Aberdeen, Repulse Bay, Stanley Beach Road and St John's Cathedral (for Hong Kong Park). Service operates from 9-45am to 4-45pm daily, every 30 minutes. Tour duration about 2 hours. The BLUE ROUTE around Kowloon starts at Tsim Sha Tsui Promenade coach bays on Salisbury Road and takes in Tsim Sha Tsui and Tsim Sha Tsui East, West Kowloon (Elements Mall, Kowloon Station and Sky100), Nathan Road and Mong Kok with stops at Langham Place, Temple Street, Peking Road and Mody Road. Service operates from 10am to 6-15pm daily, every 45 minutes. Tour duration, about 1 hour, 15 minutes. Deluxe*, Premium and Classic tickets include tickets for the Peak Tram and Sky Terrace or Sky100, *Star Ferry (Central-Tsim Sha Tsui return tickets) and also include a sampan ride in Aberdeen Harbour. Peak Tram tickets do not need to be used on the day of the tour and are valid for one month. Deluxe, Premium* and Classic Tour tickets include unlimited access to all routes for the duration of ticket validity. There is also a NIGHT TOUR departing Central Pier 7 (Star Ferry Pier) at 6-15pm at The Peninsula Office Tower, Middle Road, Tsim Sha Tsui at 7pm every night. The tour of Kowloon includes Nathan Road, Ladies Market and Temple Street Night Market. All tickets include a complimentary Rewards Booklet with discount vouchers for restaurants and retail outlets. Recorded commentary is available in ten languages including English, Mandarin, Cantonese, Japanese, Korean, German, French, Italian, Spanish and Russian. 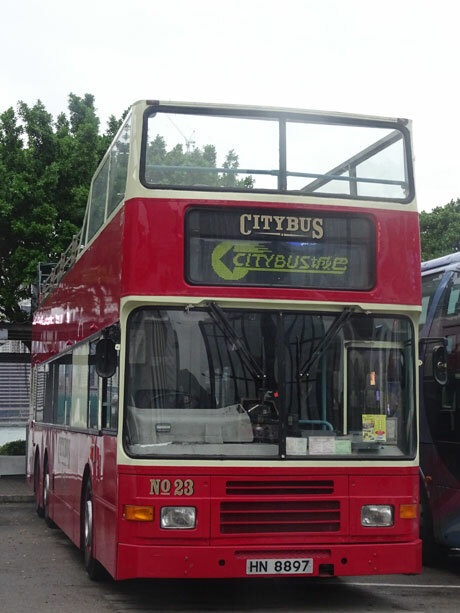 In May 2009 Citybus launched a new open-top "Citytours" bus tour on Hong Kong Island. 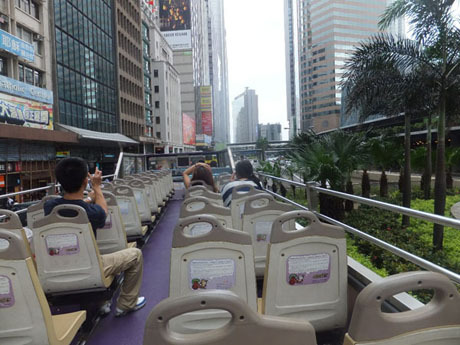 The tour which covers Wan Chai and Causeway Bay operates from 10-30am to 6-30pm daily from Golden Bauhinia Square next to Hong Kong Convention & Exhibition Centre (HKCEC). The route takes in Golden Bauhinia Square/Hong Kong Convention & Exhibition Centre, Wan Chai Police Station, The Pawn, Lung Moon Restaurant, Emperor Group Centre, Sogo Department Store, St Paul's Hospital, St Mary's Church, Hong Kong Central Library, Victoria Park, Causeway Bay Typhoon Shelter and People's Liberation Army Building. The tour lasts about 45 minutes but is not a "hop-on, hop-off" service and there are no stops en route.